A cutaway view and floor plan of a typical Pullman dining car depicts the kitchen and pantry (left) and 36-seat dining area (right). Twelve kitchen and wait staff serviced the car. A dining car (or restaurant carriage in British English) is a railroad passenger car that serves meals on a train in the manner of a full-service, sit-down restaurant. It is distinct from other types of railroad food service cars that do not duplicate the full-service restaurant experience, principally cars of various types in which one purchases food from a walk-up counter to be consumed either within the car or elsewhere in the train. Grill cars, in which customers sit on stools at a counter and purchase and consume food cooked on a grill behind the counter are generally considered to be an "intermediate" type of dining car. 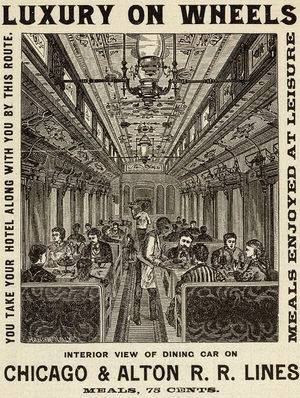 An 1880s print advertisement describes the dining experience aboard the Chicago and Alton Railroad. An interior view of a Denver and Rio Grande Western Railroad (ex-Western Pacific Railroad) heavyweight dining car, circa 1927. Chicago, Burlington and Quincy Railroad lightweight dining car "Silver Grill" passes through Denver, Colorado on October 24, 1936. The galley is located at the windowless left end of the car, while the dining area comprises the balance. "Since before the turn of the [twentieth] century, one of the defining experiences of travel by rail was a meal in the dining car." Before the inclusion of dining cars in passenger train consists became common practice, however, a rail passenger's only option for meal service in transit was to patronize one of the roadhouses often located near the railroad's water stops. Fare typically consisted of nothing more than rancid meat, cold beans, and week-old coffee. Such poor conditions understandably discouraged may Americans from making the journey westward. In 1867 George Pullman introduced the first railroad car designed and built for the sole purpose of preparing and serving meal service in transit, on a moving train. Named President, Pullman's "hotel car" combined sleeping and eating accommodations in one unit. In response, most railroads began offering some form of meal service on their trains even before the completion of the First Transcontinental Railroad. 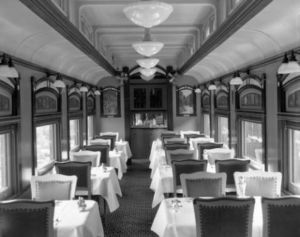 By the mid-1880s, dedicated dining cars were a normal part of all long-distance train consists departing from Chicago for points westward, save for those of the Santa Fe, who relied on America's first interstate network of restaurants to feed its passengers en route. The legendary "Harvey Houses," located strategically along the line, served top-quality meals to railroad patrons during water stops and other planned layovers and were favored over in-transit facilities for all trains operating west of Kansas City. The restaurant car first appeared in Britain on the Great Northern Railway’s route between King’s Cross and Leeds on November 1, 1879. The adoption of the vestibule (which allowed passengers to move safely from car-to-car while in motion) in 1887 effectively converted the train from a collection of separate cars to one continuous unit, which made the use of dedicated dining cars that could be patronized by all passengers a practical endeavor. Dining cars are often prized for the manner in which they enhance the familiar restaurant experience by offering a unique form of visual entertainment, namely the ever-changing views of the world outside. While dining cars are less common today than they were in the past (having been supplemented, or in some cases replaced altogether by other types of food-service cars) they still play a significant role in passenger railroading, especially on medium- and long-distance trains. Dining cars allowed for faster cross-country travel because they eliminated the need to stop for meals. As competition among the railroads intensified, dining car service was taken to new levels. In fact, it wasn’t until the 1890s, when companies promoted en route meal service as a unique selling point (and more powerful locomotives were available that could handle the additional weight) that the cars became a common offering on long-distance rail services in Britain. When the Santa Fe rolled out its new "Pleasure Dome"-Lounge cars in 1951, the railroad introduced the American traveling public to the "Turquoise Room," promoted as "The only private dining room in the world on rails." The room accommodated 12 guests, and could be reserved anytime for private dinner or cocktail parties, or other special functions. The room was often used by the era's celebrities and dignitaries while traveling on the Super Chief. In one of the most common dining car configurations, one end of the car contains a galley (with a side aisle next to it, so that passengers can pass through that end of the car to other cars of the train) while the other end supports table or booth seating on either side of a center aisle. Trains with high demand for dining car services have sometimes featured "double-unit dining cars" consisting of two adjacent cars functioning to some extent as a single entity, generally with one car containing a galley plus table or booth seating and the other car containing table or booth seating only. In the dining cars of Amtrak's modern bi-level "Superliner" trains, booth seating on either side of a center aisle occupies almost the entire upper level, while the galley is below; food is sent to the upper level on a dumbwaiter. The last vestiges of this style of transportation essentially died out in the late 1960s when the Pullman Company ceased operations. Today, however, a number of tourist-oriented railroads offer dinner excursions to capitalize on the public's fascination with the overall dining car experience. ↑ Porterfield (1993), p. 38: Pullman inaugurated dedicated sleeping car service in America when the Pioneer first hit the rails in 1865. 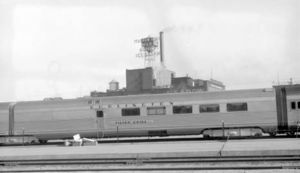 ↑ Harris, p. 420: The GNR’s cars were built by Pullman as well. This page was last modified 23:03, 29 September 2014.